Most modern battery systems used for homes or businesses are made up of lithium battery cells housed in a compact enclosure together with a battery management system (BMS). These battery systems such as the LG chem RESU series work in conjunction with a compatible hybrid or off-grid battery inverter. In the past the well known lead-acid (Gel or AGM) batteries were the only option available but this review will focus on the newer lithium batteries, plus some unique Redox flow and capacitor based batteries. Until recently almost all batteries were DC or AC coupled, although 'AC batteries' such as the Tesla Powerwall 2 are now becoming popular. AC batteries are essentially a lithium battery unit combined with an integrated battery inverter/charger and smart control systems. Modern lithium battery systems are housed in a sealed battery enclosure containing multiple sensors and battery management systems (BMS) which is essential to monitor battery voltage, state of charge and cell temperature (thermal monitoring). The 'managed' DC lithium battery systems must be coupled with a compatible solar hybrid or Interactive Inverter to operate and deliver AC power to the loads. A good example of the rapid changes happening in the battery world is highlighted in the evolution of the Tesla Powerwall. The first generation 6.4kWh Powerwall (no longer available) was a high voltage DC coupled battery which was installed together with a compatible hybrid inverter. The second generation Powerwall 2 released mid 2017 was an AC battery with integrated inverter at double the capacity (13.5kWh) and close to the same price. Another example is the LG chem RESU range of batteries which were only available in one size and are now offered in three sizes and two voltage options. LG Chem Ltd often referred to as LG Chemical is headquartered in Seoul, South Korea and was the 13th largest chemical company in the world by sales in 2014. LG Chem completed development and began mass production of Korea’s first lithium-ion batteries back in 1999. LG Chem is the world’s third-largest maker with an annual production capacity of 1,000 million cells and is also a supplier of automotive battery for electric vehicles such as the Chevrolet Volt and Ford Focus electric. Compact, lightweight battery module with integrated BMS. Compatible with a wide range of hybrid and off-grid inverters - Goodwe, Redback, Selectronic, SMA Sunny island, Schneider, Solax X hybrid, Victron Energy and many more. No DC to AC inverter included. Derates output in high ambient temperatures above 40 degC. Range of compatible hybrid inverters: SMA Sunny boy storage, SolarEdge StorEdge hybrid. Tesla is an innovative company based California, USA specialising in electric vehicles such as the model S and advanced lithium battery technology. Headed by the well known entrepreneur Elon Musk, Tesla is now known as a world leader in energy storage tehnology and is constructing the worlds largest battery manufacturing facility known as the Gigafactory which is predicted to reduce the cost of lithium-ion storage batteries by up to 30% once fully operational in 2018. Only battery available with liquid thermal cooling. Shanghai Pylon Technologies Co., Ltd. is the leading Chinese supplier and manufacturer of Lithium LiFePO Cell batteries. Producing a large range of battery systems including high Energy LiFePO Cells, Telecom Backup Lithium Battery, Lithium UPS Battery, Car Starter Battery and Electric Vehicle Lithium Batteries. Compact battery module with integrated charger & BMS. GCL (Golden Concord Holdings Limited) based in Hong Kong is an huge international company which is recognised as the world’s largest provider of solar cells. The E-KwBe is the first battery released under the subsidiary GCL system integration technology Co. Attractive battery module with integrated charger. BYD Co is a leading Chinease vehicle and lithium battery manufacturer which began operations in 1995. Initially focusing on electric vehicles and mobile phone batteries BYD has recently entered the competitive home energy storage market. Modular battery system with 2.5kWh units. Compatible with many hybrid inverters including: Selectronic, SMA, Goodwe, Solax, Victron. Modular battery system with 1.12kWh units. Compatible with HV hybrid inverters including: SMA Sunny boy storage, SolarEdge StorEdge hybrid. Simpliphi previously known as LibertyPak is US based battery manufacturer which has been a leading developer of Lithium based batteries since 2002. Initially developed for durable remote and mobile power systems the Simpliphi batteries are known for their high cycle life, safety and stability. GenZ is a small Australian battery manufacturer which assemble high quality imported LFP cells into the modular scalable battery units with integrated BMS. The units are 'self-managed' and do not require communications to the inverter like many lithium battery systems thus can also be used as a drop-in replacement for lead-acid battery systems. SOLARWATT GmbH based in Germany was a well known solar panel manufacturer but restructured in 2012 to focus on energy solutions including battery storage systems. SolarWatt also created a partnership with BMW i to deliver high efficiency, large scale solar PV solutions. Modular battery system with integrated inverter/charger. Suntellite Group headquarters is located in Zhejiang University with two major manufacturing plants in China, 14 laboratories and five engineering research and technology centers throughout China. Solax Power a subsidiary of the Suntellite Group manufacturers solar cells, panels, inverters, solar racking and LED lighting technology. Solax teamed up with LG chem to create the solax battery. Ecoult was formed in 2007 by the leading Australian scientific research organisation (CSIRO), but was acquired by the United States-based East Penn Manufacturing Company in 2010. The Ultrabattery is based on a unique long-life lead acid/ carbon capacitor technology and is lead based so is easily recyclable and environmentally sound. 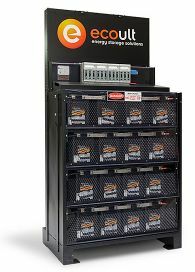 Ideal for larger commerical energy storage systems wih high demand plus well suited for remote microgrids. Aquion Energy is headquartered in Pittsburgh, with a manufacturing facility in Westmoreland, Pennsylvania. Aquion’s Aqueous Hybrid Ion (AHI™) battery systems are optimized for stationary, long duration daily cycling applications, including off-grid and microgrids, energy management, and grid-scale energy storage applications. The batteries utilize non-corrosive reactions at the anode and cathode to prevent deterioration of the materials. The water-based chemistry results in a nontoxic and non-combustible product that is safe to handle and environmentally friendly. May require additional battery management system to operate. Redflow, now an International company started in Australia has a new manufacturing facility (relocated) in China. The Zcell was one of the worlds first domestic flow battery systems (based on the previous version Redflow ZBM2 battery). The unique zinc bromide flow battery technology developed by the University of Queensland is capable of 100% discharge and can withstand partial or no charge for prolonged periods of time without degradation. Enphase Energy is a Californian company founded in 2008. Enphase is considered the world's leading manufacturer of solar micro-inverters and is well established in the US market. The recent release of the compact AC battery in mid 2016 is one of the first modular AC battery systems available. Sonnen is successful German company founded in 2010. Previously known as Sonnenbatterie, Sonnon has become a leader in developing high quality, modular energy storage systems for residential and commercial applications. Must be installed indoors or in protected area.